Community Paramedicine is a newer form of healthcare that shifts paramedic into a proactive role of assessing, monitoring and treating patients in their homes. Grey County is piloting a series or community paramedicine programs aimed at improving resident health and reducing admissions to local hospitals. Most of these programs focus on residents living with chronic diseases and vulnerable people without easy access to primary healthcare. The paramedic referral program supports Ontario’s Action Plan for Health Care (2012). Patients over 65 who call 911 for non-emergency assistance are screened by paramedics using the ‘PERIL’ assessment tool. If the patient is determined to be at risk in their home the paramedic will offer a referral to the LHIN Homecare Program. 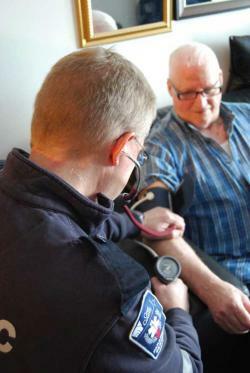 The Community Paramedic Home Visit Program uses highly skilled community paramedics to monitor and treat patients in the comfort of their own home. In-home treatment can help prevent a medical condition from progressing to a point where a hospital visit is necessary. This program focuses on patients with the chronic conditions diabetes mellitus, congestive heart failure and chronic obstructive pulmonary disorder (COPD). This program benefits patients with access to transportation who find it difficult or impossible to attend regular appointments. The Community Paramedics have received advance training through Centennial College and work closely with each patient’s primary care practitioner. They can consult with an on-call physician after hours and on weekends to provide care. The Remote Patient Monitoring program involves patients with chronic obstructive pulmonary disorder (COPD) or congestive heart failure who make multiple 911 calls or visits to the emergency room (at least three) within a year. Community Paramedics can provide oversight of patients using a remote monitoring system that records health data (pulse, blood pressure, oxygen saturation, blood sugar and weight). If a patients data falls outside of a threshold, Community Paramedics are notified and can check in. CP@Clinics is a research program in partnership with researchers from McMaster University Department of Family Medicine, Grey County paramedics, Grey County Housing and Grey Bruce Links. Older adults are invited to free weekly clinics where paramedics conduct blood pressure, diabetes and fall risk assessments. Paramedics provide health education and promote community programs and resources to participants. If necessary, patients can be referred to their primary care practitioner. In Grey County, CP@Clinics are held in select community housing buildings. Grey County Housing staff also attend these meetings to provide resources to attendees and to promote healthy living initiatives, such as the Good Food Box program. We want Grey County to be inclusive and welcoming to people of all ages and abilities. We recently partnered with students from the University of Guelph to look at policies that better support youth and older adults.